Dr. Zaki never had a doubt that he wanted to become a great dentist since his early years. His high school friends, who are now his patients, continue to be amazed by his commitment and strong will. Dr. Zaki attended Saint John’s University in New York, where he received his Bachelor of Science, class of 2004, while finishing in the top 3 percentile of his class. He then went on to receive his Doctorate of Dental Surgery from the State University of New York, School of Dental Medicine at Buffalo, class of 2008, where he earned several prestigious awards for excellence in dentistry. Thereafter, he completed a post graduate General Residency Program at the Peninsula Hospital Center in New York. To fulfill his dream of being involved in dental academia, Dr. Zaki is a Clinical Instructor at Lake Erie College of Osteopathic Medicine (L.E.C.O.M. ), School of Dental Medicine in Bradenton, FL. Dr. Zaki is a standing member of the American Dental Association (ADA), the Florida Dental Association (FDA), the Academy of General Dentistry. (AGD), the New York State Dental Association and the Queens, NY Dental Association. In addition, He was selected as a candidate by The International Association of Dentists. When not in practice, Dr. Zaki is committed to serving the community as an active member and servant of St. Simon’s Coptic Orthodox Church in Sarasota. Dr. Zaki travels abroad yearly on Dental mission trips to various parts of the world, including North Africa and South America to help those in need, then comes back with great memories that he always shares with his existing patients here at home. 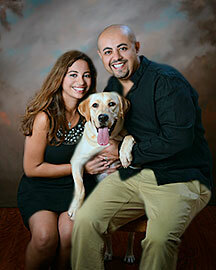 He also enjoys going to the beautiful beaches of Sarasota/Bradenton with his family, and following sports with his life-long friends, all that while him and his wife, Mariann, attempt to contain his infamous trouble-maker yellow Labrador, Lexi.